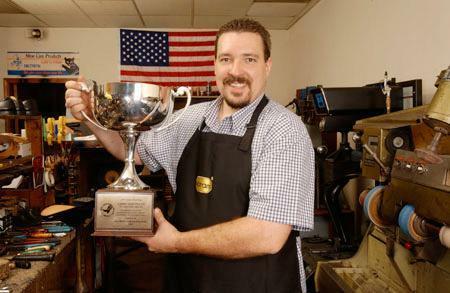 Larry Schupbach of Village Shoe Service 3900 Lavista Road Suite 104 Tucker, GA has been honored by his peers for his craftsmanship and awarded the Grand Silver Cup in the Shoe Service Institute of America's 2003 international Silver Cup Contest. Schupbach was chosen for recognition by his peers on the basis of his workmanship. To enter the contest, Schupbach submitted two pair of men's shoes and a pair of ladies' shoes. One shoe from each pair was repaired with a new sole and heel. The repaired shoes were then refinished to look like new. "One of the principal benefits of shoe repair is that consumers can have their shoes repaired to look like new, but for a fraction of the cost of new shoes," says SSIA Association Manager Jimmy Benson. "The purpose of the Silver Cup Contest is to recognize craftsmen such as Larry Schupbach who maximize that benefit and set the standards for our industry." Benson continued to say that the benefits shoe repair offers go well beyond the cost savings. There is the environmental benefit of the millions of pairs of shoes that do not end up in landfills each year. There are the physical benefits that a well maintained, high quality pair of shoes brings. Finally, there are the medical benefits of shoe repair offered by shops that specialize in orthopedic work. "All of these benefits start with superior craftsmanship," he says. "That is why craftsmen such as Larry Schupbach are so important." Judging for the contest took place in June at the Orlando offices of Florida Leather Co. Two master craftsmen and past Silver Cup winners, with a combined 75 years of shoe repair experience served as judges. The judges compared the repaired shoes to their unrepaired mates and evaluated the entries based on how well Schupbach had restored them to their original, factory condition. The Silver Cup Contest, an international competition dedicated to excellence in shoe repairing, is sponsored by Supplier and Wholesale members of the Shoe Service Institute of America, and the craftsmen of the shoe repair industry. For more information please contact Larry Schupbach at 770-938-7463 or SSIA Association Manager Jimmy Benson.